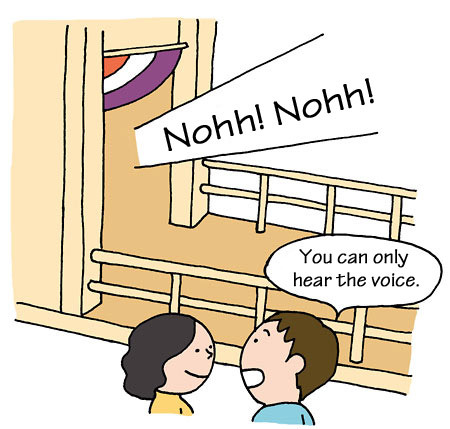 TRIVIA of Noh : Q76 : What is the voice from behind the curtain? | Home | Trivia | Q76 : What is the voice from behind the curtain? What is the voice from behind the curtain? The leading actor has a form of entrance known as "yobikake" (calling out). When the curtain rises, the leading actor does not appear immediately, but calls " nohh, nohh" from behind the curtain to the supporting actor on stage, then appears on the bridgeway. In existing repertoires, more than thirty pieces employ this effect. In some of them, tsure (third actors) and kokata (actors playing juvenile parts) also appear in the same manner. The rising curtain creates excitement for the audience and they concentrate on the actions of the leading actor coming from behind it. Their imaginations are further awakened if the actor does not appear and they only hear his voice. Yobikake is employed to make the audience conscious of a sense of distance, and to heighten the presence of the leading actor who calls out. Because yobikake is done without music, the unseen actor has to create the atmosphere with only a short verse of chanting. In the Azuchi-Momoyama era (1573-1603), it is believed that yobikake was performed by actors who appeared on the bridgeway and it spread as a useful effect to employ the stage structure.